The 3rd verse in Nephi's Courage likens how we can be like Nephi so I thought, what better way to convey that message than to dress up the kids like Nephi! Find my lesson plan for teaching the 1st and 2nd verses HERE in case you missed it. The mask/crown pictured above is no longer available but Susan Fitch created one HERE that you can purchase from her Etsy shop or she has a black and white version HERE for free. It might be fun to have all of the kids color and make their own to take home! For my mask/crown I printed it on white card stock, cut it out, laminated it and punched 2 holes on the sides near the jaw line to tie elastic around it. I opted more for more of a crown version than a mask that they can wear up on their foreheads - I want to still be able to see those kids singing ;). Then I have a little super hero cape I'm bringing. For large primaries, I'd suggest making several masks and bringing a few capes. 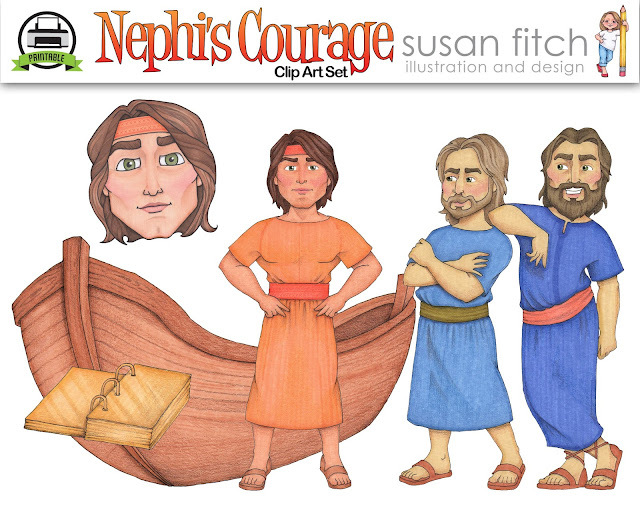 For Jr. Primary, I'll just rotate all the kids so they can each have a turn being like Nephi, the super hero, to come stand up front as we sing the 3rd verse. I'll pick my best singers to come up. The kids up front will lead in doing the actions on the chorus. Find those HERE. For Sr. Primary, I'm going to write the 3rd verse with chalk on the chalkboard. We'll sing the song and I'll have the best singers put on the Nephi crown (if they want) and come erase a word one at a time. "A true super hero is Valiant, you can count on them. Did you know that the Lord is counting on you to prepare the world to receive the gospel and He is counting on you to prepare the world for Jesus to come again. Did you know that the Prophet is counting on you? President Monson said “Have you ever stopped to consider that the Prophet of God is counting on each one of us? Yes, he is counting on our conduct. He is confident of our courage. How I pray that each may declare, “I RESOLVE TO MERIT THE PROPHET’S TRUST.” “I shall not deviate from my duty.” I shall not dishonor my divine destiny”. (Crisis at the Crossroads, New Era, Nov. 2002). I bear my testimony that you are special. Heavenly Father has sent you here at this time in History, to your family, to Sherman Oaks ward because he knows you are capable of Great things. He needs you! I hope you will decide that you will be the Lord’s Super Hero. Be Valiant, Have Faith, Be Obedient. If you do these things the Lord will bless you with Power to accomplish all that He commands. He will Provide the way!" I'll admit, I'm just not much of a talker in primary and I should probably do more but it's just not my style. I prefer to sing. I like to try to get the kids to feel the spirit by becoming so familiar with the songs that when they sing, they can individually feel the Holy Ghost. I just came across your blog! I just have to say that I am SOOOO THANKFUL for people like you!!! THANK YOU for sharing your creative ideas and hardwork! I am fairly new to my calling in primary, and I have NO musical background, little creativity and feel completely un-qualitified for the position. People like you make it so I don't completely flop every week. People like you are the reason my primary children still have a meaningul music time. Thanks for taking the time to do this. You have saved me with Nephi's Courage! Ditto to what Krystal said...just found your blog this morning and am TOTALLY inspired!!!!! THANK YOU!!!!! I am also new to my calling and even though I have a musical background and teaching experience, fresh ideas are always needed! Thank you so much! I had no plan for today, and this was exactly what I needed! What a lifesaver. Hi Camille! I add my thanks to you for this great blog! I'm actually not the primary chorister, but I'm a newly called sunbeam teacher and I live in France in a very small ward. There is LOTS of room to help and I'm helping the chorister. I have almost 2 years experience in the calling myself, but it's been many years and many 'head spaces' since! ...this is helping me really get it all back, I have none of my old things, and I'm helping her in French, so I'll be translating a lot of what you post. Thank you thank you!!!! Camille, you have inspired me so many times since January when I received this calling. I am so grateful for you! Isn't this the best calling in the church! I can't think of any other I like better and at this point in my life (62 years) I've done them all!